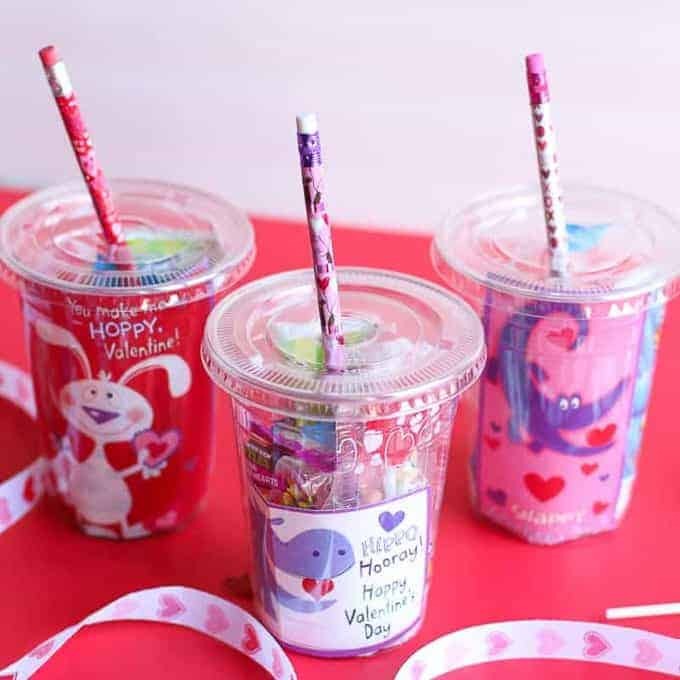 These easily made cups are the cutest and sweetest DIY Valentine’s Day gifts for students. 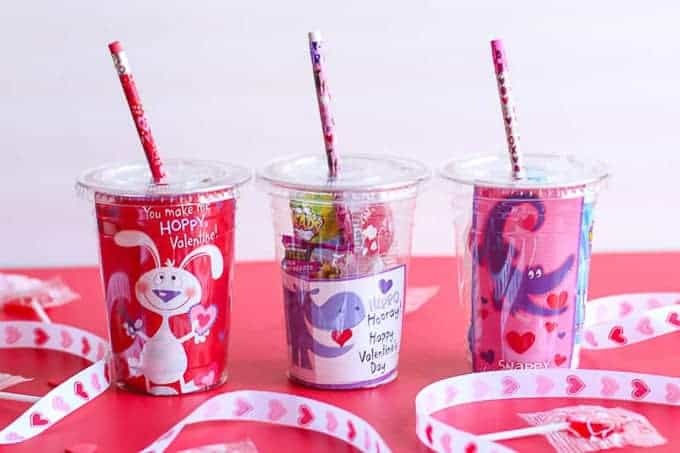 They also make great Valentine’s Day craft for your children to gift to classmates. My Mother is a school teacher for special needs children. It is an overwhelming amount of work that is both challenging and rewarding. She has three grades at all times in her classroom, therefore, she never gets a break. I volunteer and substitute teach in her classroom often and I am at an awe and admiration for the hard work and patience. The days I work in her classroom and I come home exhausted. Some days I can’t even talk after. These children require so much physically and emotionally that you are just drained at the end of the day. I honestly don’t know how my mother and her assistants do it day in and day out. However, with each roadblock met there is also a milestone that is eventually reached. With each behavior modification challenge, there is a huge hug and smile later. These children love BIG. You can’t help but become attached and love them back. Teachers don’t teach for pay; their paychecks are so small when you calculate all the after-hours put in. They teach for their heart. There is a quote, “Every child is gifted. They just unwrap their packages at different times.” Watching these children blossom is the biggest reward one can imagine. I am so proud of my mother for all the love, hard work, and time she puts into her classroom. “Real heroes don’t wear capes. 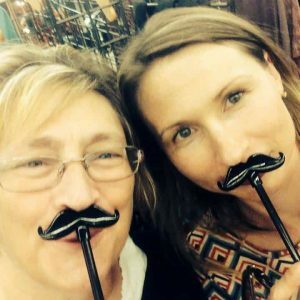 They teach.” – I love you Mom. With that said, I am always bringing in goodies for my mother’s class. These kids have my heart and it brings me joy to see them happy. Their little faces light up whenever I bring them something special. 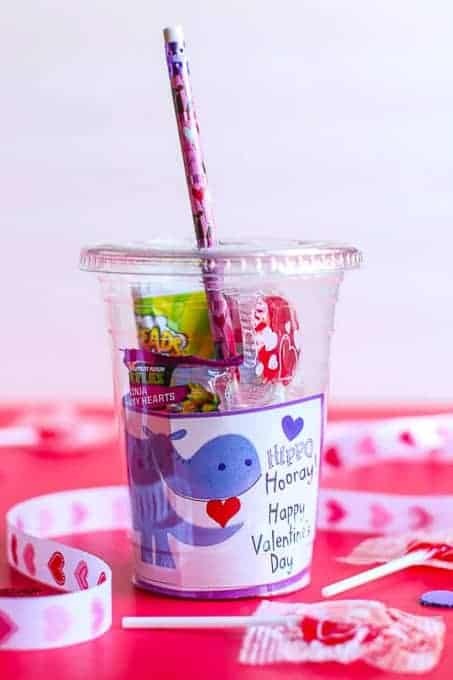 These DIY Valentine’s Day gifts for students can be easily be made in minutes and are very inexpensive to make! They make a great gift for teachers to give to their students also. Making DIY Valentine’s Day gifts for students are so much fun and you can do it in minutes. relatively cheap online. They ship very fast if you have Amazon Prime. Add in a little Valentine Card in the inside for decoration. There you can write your Valentine’s message. Then fill with goodies. I filled mine with candy, but you can add in small toys also. In place of a straw, insert pencils. Aren’t they adorable? They are so much fun! 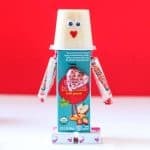 Another cute Valentine’s Day Party favor are these cute little Valentine’s Robots. They also make a cute Valentine’s day gift for kids. If you like this post about DIY Valentine’s Day gifts for students, check out: Easy DIY Bunny Gift Bags, Halloween Frankenstein Classmate Gift, Homemade Dog Treats, and How to Decoupage Easter Eggs. My son is in a class that sounds exactly like your moms. It’s so special to us. I can’t wait to make these for his class. I think I am going to do that for my daughter’s classroom.